Things are finally starting to look up for the Los Angeles Dodgers. They enter the final day of May as winners of 10 of their last 13 games. That run has them within 3.5 games of first place in the NL West. More importantly, they will close out May by welcoming ace Clayton Kershaw back from the DL. Kershaw will be activated in time to start Thursday’s series finale Phillies. Of course, Los Angeles will also take a step back after placing Kenta Maeda on the DL on Wednesday. Upon his return, Kershaw will have missed roughly a month of action. His last start came on May 1 prior to going on the DL with biceps tendinitis. He missed his turn through the rotation four times. However, after throwing four innings in a simulated game on Sunday, the Dodgers are ready to bring Kershaw back from the DL without a minor league rehab start. Before going to the DL, Kershaw wasn’t quite having his best season. In seven starts this year, he’s just 1-4. Of course, he can hardly be blamed for those losses. 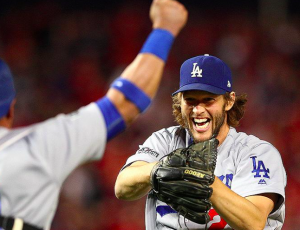 Kershaw has a 2.86 ERA, which is high for him, but more than respectable. More importantly, the southpaw doesn’t expect to feel the effects of a month on the sidelines. Surprisingly, the Los Angeles rotation has held its own with Kershaw, Rich Hill, and Hyun-Jin Ryu all on the DL. Alex Wood has remained consistent despite a 1-4 record. Ross Stripling and rookie Walker Buehler have also stepped up. Stripling has dominated as a reliever this season, but he also has a 2.18 ERA in six starts. Buehler has a 2.20 ERA in seven starts, including the team’s no-hitter earlier this month. Of course, the Dodgers will now have to deal with Maeda joining Hill and Ryu on the DL, even as Kershaw is activated. Maeda has posted a 3.61 ERA in 10 starts and one relief outing this season. He and Wood had been providing the Los Angeles rotation with much-needed stability. However, he’ll be out for the foreseeable future because of a hip strain. The Dodgers are hopeful he’ll only miss one start, but they aren’t looking to rush him back. In the meantime, it’ll be up to Kershaw, Wood, Stripling, and Buehler to keep up the momentum the Dodgers have created the last two weeks. With Maeda now out, Los Angeles is still lacking a consistent fifth starter. But with the return of their ace on Thursday, the Dodgers have to be optimistic about being able to climb their way back to the top of the NL West.